Discussion in 'Wiring' started by Buddababy, Apr 16, 2019 at 8:33 PM. Have a Komfort t.trailer. Have beeping coming from converter. Worked fine on 120V but when I hooked up the 2 -6 volt batteries along with shore power the converter started to BEEP. The converter is old and no longer made. It works on only 12v and only 120 Volts ....What the heck????? Are you sure the battery is connected correctly. Do you have a gas detector near the converter? They will beep if there's low voltage. >> It works on only 12v and only 120 Volts ....What the heck????? Question, does your batteries have enough juice? Because your camper is so old it won’t charge your battery’s in tow. I wonder if your converter is able to sense low power. If you have the original converter it will not work on shore power and battery power at the same time, but you should be able to connect both. There should be a 3 way rocker on the panel to switch from battery to converter. My guess would be that you have the batteries connected in parallel rather than series and you're only getting 6 volts, the beep would be a low voltage signal. Incandesant lights and fan will work off of 6 volts, but better of of 12. Read http://www.marxrv.com/12volt/12volt.htm. Batteries are new 6 volt wired in series. Not sure if it is original converter.Would guess yes as nobody around here knows anything about it. can not find a disconnect to eliminate either 120 or 12 v on converter. It could be a trouble code. Is there a break in the beeping? If so you need to google that converter for a manual. I still am wondering if the leads coming from the converter to the battery is missed wired (backwards). It is easy to do, most campers used Black as the plus and white or green as the ground (neg). Most of the circuits in a camper will work if connected backwards. 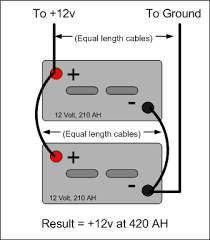 But if the converter is connected to the battery backwards it has to charger from -12V to +24V that is a total of 48V. Maybe it starts to charge hits a protection mode, beeps and turns itself off, than tries again?? ?